By John ~ March 9th, 2011. Let me cut right to the chase. If you ever plan to go to Walla Walla, Washington (or go back to Walla Walla), you need to buy this book, WineTrails of Walla Walla. You can find it in most Washington wine shops and winery tasting rooms, or you can order it online. This is Steve Robertsâ€™ fourth book in his series of WineTrails guidebooks. He began this wine book odyssey with the best seller, WineTrails of Washington, and followed it up with WineTrails of Oregon and WineTrails of Idaho. Steve is one of the nicest guys youâ€™ll ever meet, and his interest in wine is only surpassed by his skills as a writer and photographer. I love his work. What makes WineTrails of Walla Walla different, and more valuable, than his first three guidebooks is that itâ€™s not just a book of wine trails. 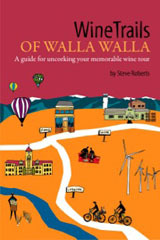 This book has valuable sections on places to eat, places to stay, and things to do in Walla Walla in addition to his signature WineTrails about wineries to visit. Iâ€™ve been to Walla Walla many times, but I had no idea that there was a childrenâ€™s museum that my granddaughter could visit or a symphony or a balloon stampede. I did think that I knew most of the places to eat and places to stay, but Steve found a few that were new to me. Iâ€™m really looking forward to exploring some of these new finds on my next trip to Walla Walla. To make your visit to Walla Wallaâ€™s wineries with public tasting rooms easier, Steve divided the wineries into five separate WineTrails: West (9), Downtown (25), Airport (16), East (4), and South (19). As you can see by the number of wineries on each WineTrail indicated in parentheses, it could take you many, many days or a number of trips to Walla Walla to visit them all. So curl up with this book and plan your first or next trip to Walla Walla. I believe that using this guidebook will make it your best Walla Walla trip ever. By the way, after I wrote this review, Steve called it to our attention that he had mentioned Wine Peeps in his write-up about Rotie Cellars. Somehow I missed it in my first pass through the book. So be sure to check out page 86. John, you are too kind! Thanks for the write-up…most appreciated. Also, I wanted to mention that there is or will be a companion app available for the iPhone and iPad. Yes, indeed, a WineTrails of Walla Walla app will be available shortly (by April I would imagine) at the iTunes store. It’s a companion app and gives me a chance to update that contents of the WineTrails of Walla Walla book periodically. Priced at $2.99 it should make a smart addition to your smartphone apps! Thanks for the heads-up on the iPhone app for this book. Sound like a great way to keep readers current on Walla Walla. Please keep our readers posted when it is actually available. WineTrails guidebooks are so interesting, informative and fun to read. Very enjoyable review. Thank you for your insights. Your recommendation for this guide came at just the right time. My wife and are will be heading to Walla Walla for the first time in June. Ordering the book right now! That’s great, Steve. I know you’ll have a great trip with the help of Steve Robert’s Guidebook.